As long as I can remember at every holiday meal my mom would always make this recipe. It has become a mandatory staple at all holiday meals. The recipe was handed down to my mother from my great grandmother McCauley whom I have wonderful childhood memories. When ever the holiday menu is being planned it is always the first thing I request and there have been only a few instances when we have not had it at our family gatherings. Without it the meal just isn't complete. 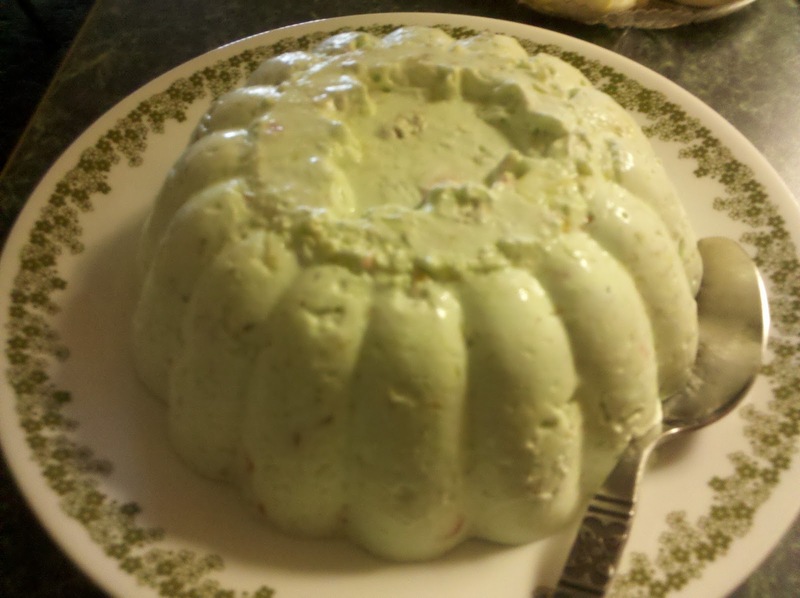 1 small pkg lime jello. 1 small can crushed pineapple. walnuts,chopped, marchino cherries cut in small pieces. double the recipe by using a lg. cottage cheese, lg, pkg, jello,12 to 16 oz cool whip and regular size can of pineapple and adjust the amount of nuts and cherries. can also do orange jello an mandarin oranges or red jello and strawberries. I always add the nuts but the cherries just with the lime jello for Christmas time to give it the Christmas color and it tastes good to.